For years, we’ve known Jon Bon Jovi as one of the many musical mougs from New Jersey who made it big. While you might assume he’s busy in the studio working on songs for his newest record (which you’d assume correctly…the rockers next CD will be hitting shelves in 2013 followed by a world tour), what you may not have known is that he and his wife, Dorothea Bongiovi, have been active in the community the rocker grew up in trying to make a difference for those less fortunate. The pair are at it again and have just unveiled their latest project to try and give back. The Soul Kitchen is the new gourmet restaurant the couple have opened. However, it’s not like any celebrity gourmet restaurant you’ve ever heard of, this is one everyone can afford. Their “pay-what-you-can” menu offers some of the finest gourmet quality meals to those who can’t afford to eat out. Paying customers are asked to leave what they can in the envelopes left on the tables while those who can’t pay money are simply asked to pitch in. “When I learned that one in six people in this country goes to bed hungry, I thought this was the next phase of the Foundation’s work.” he added. The Foundation Jon is talking about is the Jon Bon Jovi Soul Foundation. Other projects they’ve completed through the help of their namesake is building 260 houses for low income families, charity concerts, a local food pantry they began helping in several years ago, and their soup kitchen, Lunch Break, which feeds over 100 people per day, the one that started it all. Now, after a year and $250,000, The Soul Kitchen is open to those who still want to enjoy fine quality dining at a price they can afford while giving back to the community. The restaurant offers a menu rich in gourmet soul food you’d find in any of the areas most famous eateries. Cornmeal crusted catfish with red beans and rice, grilled chicken breast with homemade basil mayo and rice pilaf and grilled salmon with soul seasonings, sweet potato mash and sauteed greens. Not only do the options sound mouth watering, many of the ingredients were grown in the herb and vegetable garden right outside the doors of the establishment. Once you’ve volunteered at these places, you’ll earn a food certificate good at The Soul Kitchen for your meal. This idea is all part of a bigger plan for the Foundation to help bring back some community and help people who are struggling know that there are people out there who care about them while giving a little back in return. Bon Jovi urges those who can afford to dine out to patron The Soul Kitchen to help make this a true community resource. They are open for dinner near the Red Bank train station in central New Jersey Thursday through Saturday and also offer Sunday Brunch. He and his wife have been staying active in the restaurant and the New Jersey moug we all know and love has been working there at least once per week to pitch in. While you might think he’s busy creating delicious dishes to don the menu with his decades of experience dining in the worlds best restaurants, you might be surprised. We have to say, this is by far one of the coolest things we’ve heard of recently. 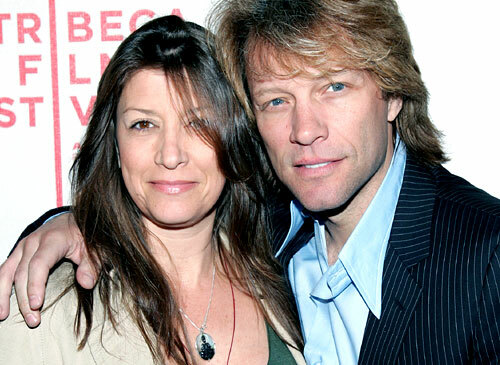 We wish Jon and Dorothea and the rest of The Jon Bon Jovi Soul Foundation much success. So what do you think about this Celebstalkers? Isn’t is great to see celebrities giving back to the community? This entry was posted on October 20, 2011 by Echo Bravo and Foxtrot Charlie. It was filed under Breaking Celebrity News, Celebrity Couples, Know Your Celebrity, Mougar News, Music News, Top Celebrities and was tagged with 2013 music, 2013 music tours, albums to be released in 2013, bon jovi, bon jovi new album, celebrity charities, celebrity couples, celebrity restaurants, celebstalk, celebstalkers, charities, dorothea bongiovi, dorothy bongiovi, jon and dorothea bongiovi, jon bon jovi, jon bon jovi and dorothea bongiovi, jon bon jovi and wife, moug, mougar, mougs, music, music news, musical moug, new jersey celebrities, new jersey celebrity charities, new jersey mougar, the jon bon jovi foundation, the jon bon jovi soul foundation, the soul kitchen, tours in 2013, what does the jon bon jovi foundation do?, when does jon bon jovi's new album come out?, when will bon jovi tour again?. when does bon jovi's next album come out?. Awesome doesn’t begin to describe what you and your family have done by opening this restaurant. I’ve always been a fan but it’s apparant that I, as well as your other fans, are drawn to you not only because of your music but also because of your kindness. Perhaps one day I’ll have the opportunity to travel out East and have the pleasure of eating at your restaurant. Until then, best of luck and keep on sharing the gifts that God has bestowed on you. Thank You!